When critiquing your presentation slides, consider contrast. Contrast ensures our eyes are drawn to something that is different, something that stands out from its environment. Contrast helps drive our attention, and it’s one design principle that makes almost any of the other principles work. Where are our eyes drawn? The red building where it’s different from its environment. We can use contrast in our slides to help direct people’s eyes to a certain place, to make sure that something is shown as the star of the slide. There are different types of contrast. There is contrast of size, shape, shade, color, proximity. You can look at the shapes in the slide above, for example, four blue circles, but our eyes are drawn to one of them, one that’s different from its environment. 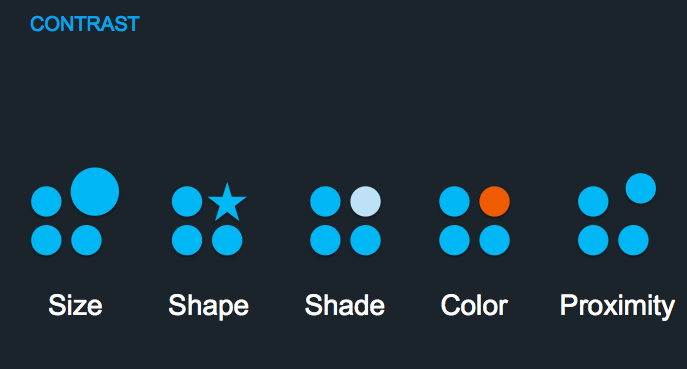 Same thing with shape, shade, color and proximity. These are all four small circles and the same size, but one is slightly out of the grid, if you will. Our eyes are drawn to that one. We can use this to our advantage on our slides, to draw people’s attention to a certain element. When slides lack contrast, we don’t know where to look.